In our May edition 2007, we reported that five active players were within striking distance of becoming members of baseball’s most impressive club – The 500 Home Run Club®. 2003 with Sammy Sosa and Rafael Palmeiro. But, with Jim Thome’s 500th long ball on September 16th, 2007, the remote possibility became a remarkable certainty, as we welcomed three incredibly talented and prodigious “super sluggers” (Thome, Alex Rodriguez and Frank Thomas) into baseball’s most exclusive, albeit growing, fraternity. Editor's Note: Manny Ramirez became the 24th member of the 500 Home Run Club on May 31, 2008 - see "Newest Member of Club; Ramirez Holds Playoff Home Run Record"
Thome continued hitting homers at an impressive clip, ending the 2007 season with 505. He has since increased his career tally to 524 and counting, moving past Eddie Murray (504), Mel Ott (511), Eddie Matthews (512), Ernie Banks (512), Frank Thomas (520), Ted Williams (521) and Willie MCovey (521) to take exclusive claim to the 16th spot on the all-time home run list. Next Up: Jimmie Foxx (534) and Mickey Mantle (536). 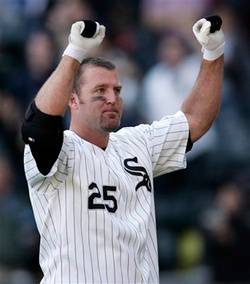 Jim” Thome joined the club with style with a two-run WALK-OFF shot in the bottom of the ninth inning to give the Chicago White Sox a victory over the Los Angeles Angels. The September 16th blast was Thome’s 28th of the season and made him the 23rd member of the 500 Home Run Club®. The White Sox slugger drove a 3-2 pitch from reliever Dustin Moseley to left-center, Thome raised his arm in the air as he rounded the bases, and he was mobbed by his teammates at the plate before he hugged his father and wife. The White Sox hoisted Thome on their shoulders. "It's hard to explain what's going through me right now," he said. "What a great day. It's tough to hit home runs when people want you to." Thome said he hoped his milestone could come during a victory, and it did. Chicago rallied from a 7-1 deficit to win the game 9-7. “When you see you’re teammates there at home plate waiting for you, it’s like something straight out of a movie script,” Thome said. After a monster 2006 with saw him named The Sporting News’ AL 2006 Comeback Player of the Year, Thome started out 2007 on fire, hitting a White Sox club-record 10 home runs in the month of April, beating his predecessor Frank Thomas' record by one. Considered one of the most "complete" power hitters of his decade, due to his ability to create extra base hits, maintain a solid batting average for a power hitter, and get on base, Thome has a staggering .562 career slugging percentage, and a career .407 on base percentage; not to mention that he has as many 100-RBI seasons (nine) as McCovey and Willie Stargell combined, and as many 40-homer seasons (six) as Willie Mays.